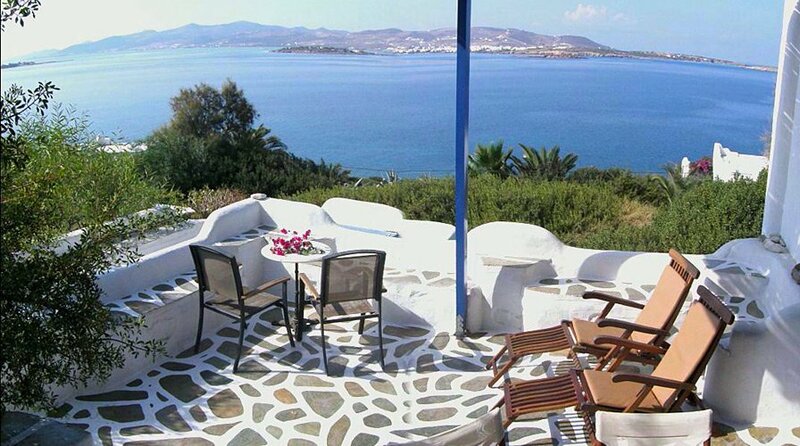 The lovely Paros Villas Agia Irini situated on Agia Irini Bay on Paros Island are a collection of nine fully-detached classic Cycladic-styled houses in a peaceful garden setting overlooking the sea. Each of the houses can accommodate 4-6 people and they are only metres from the beach — and they all boast stunning views of the Aegean Sea, the nearby islands and spectacular sunset panoramas. The villas all have living rooms, fully-equipped kitchens and bathrooms and private seaview verandas and one of them has a private swimming pool. The villas are artfully furnished with artworks and ceramics from local artisans and surrounded by sprawling, lush well-tended gardens stretching right to the seaside and the gentle lapping of the ink-blue Aegean. An ideal selection of beautiful Greek island style holiday homes in a beautiful setting, available for rental all year-round.